Airdrie is reputed to be the site of the battle of Aerderyth in 577 A.D. when Aidan, king of Scots, is said to have been defeated in a great battle with King Roderick of Strathclyde. 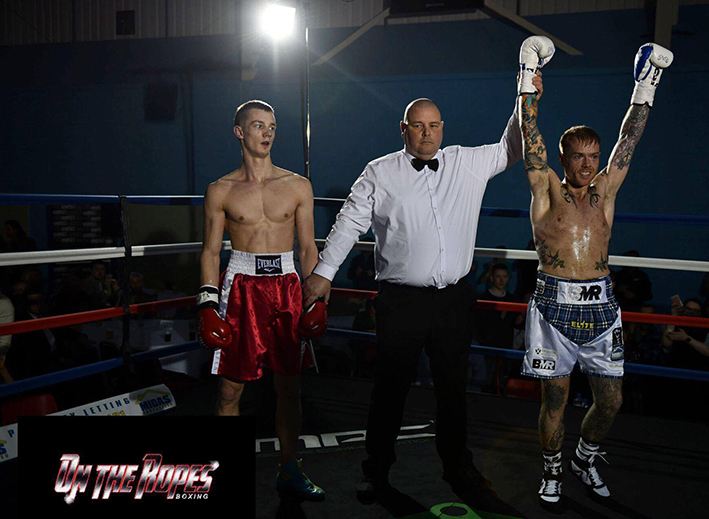 Well on Saturday night there was another great battle that took place just a short distance from the ancient battlefield, this time in the ring as Scotland took on Latvia in a special International event on the Gerard Welsh’s On The Ropes promotions latest offering at the Stanrigg Memorial Hall. Opening contest of the evening see Barrie McRorie take on Igors Dubovs in a four rounder. Right from the off McRorie started working the body of his awkward opponent, Dubovs though is as tough as he is unorthodox, style wise, and seemed happy to absorb those that penetrated his guard, before countering with a hook or straight right. As the round progressed McRorie was finding more and more gaps opening up in Dubovs’ defence and clinically punished the Latvian with combinations to body and head. As the fight entered the final minute McRorie dummied a shot to the head, Dubovs raised his guard and the savvy Scot let rip with a cracking shot to the body to send Dubovs to the deck. 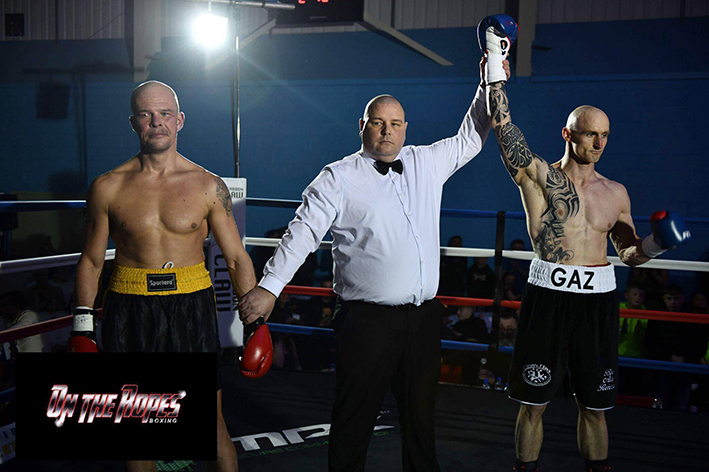 As referee Liam Bonner made the count the Latvian tried desperately to rise in time but just couldn’t leaving the referee no option but to wave the fight off on the two minute six second mark. 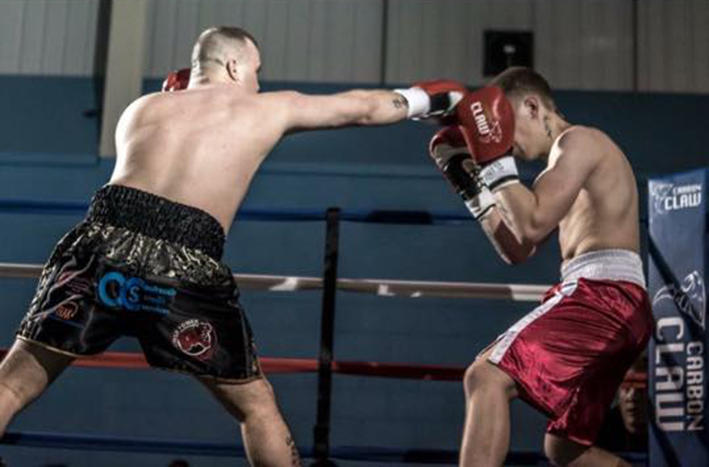 Next up was Gary Wilson versus Dmitrijs Ovsjannikovs in a six rounder. 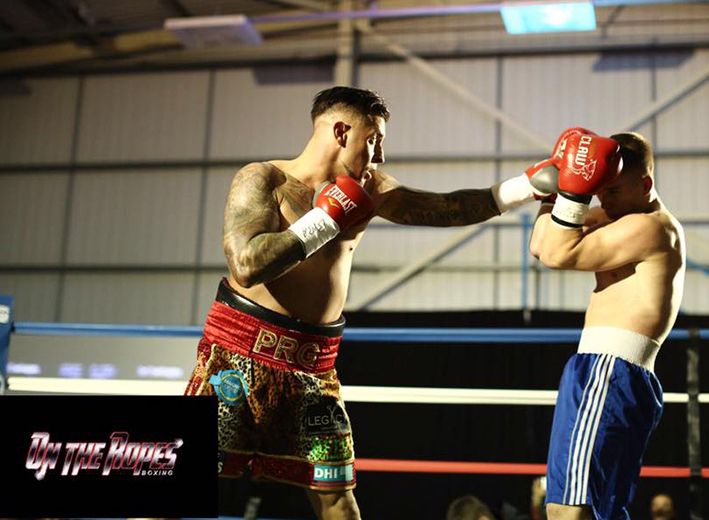 As with the previous fight the local fighter Wilson went in hard and fast specifically targeting the body, and like his compatriot Ovsjannikovs utilised his tight defence to minimise the effectiveness of the shots. About a minute in Wilson started utilising his jab to force the Latvian to raise his guard, which had the desired effect of leaving a slight opening to the body, which Wilson just wasn’t going to ignore, letting rip with a massive shot that was just so sweet and pin point perfect. The durable Latvian dropped to the canvas and clearly in distress, desperately gasping for breath eventually Ovsjannikovs tried to rise to his feet, but he left it too long and only started to rise on the count of eight, which left referee no option but to wave this contest off in the first round too, this time though on just one minute and twenty two seconds. 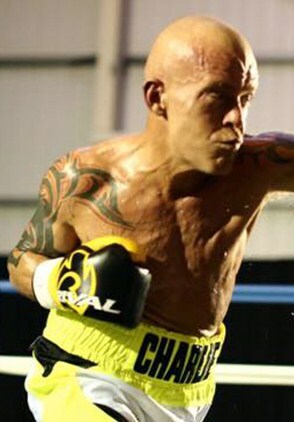 Reilly was out in a flash as the bell opened the proceedings, the Scotsman striding across the ring in just a few steps before letting rip with a big right hand. Nikitenko reeled backward but then, as Reilly lined up another big shot, the Latvian stepped to the side and threw a big shot of his own that just failed to meet its target and so began an entertaining interlude as the Latvian began dancing around the ring in an effort to avoid further big shots landing. Reilly though began to cut off the ring, corralling the Latvian backwards towards his own corner before proceeding to pepper the Latvian’s body with big shots. About half way through the round Reilly landed a cracker to Nikitenko’s lower rib and the Latvian dropped to the canvas like the proverbial sack of potatoes. Almost as one the crowd were on their feet cheering their man, as they thought it was all over, but unlike in ‘66 it wasn’t as Nikitenko is made of tougher stuff and managed to get to his feet just in time to beat the count. On the restart Reilly went at it full pelt, Nikitenko tightened his defence and absorbed the punishment, even managing to land the odd counter shot occasionally, then just as the final bell of the round literally tolled the Scot landed another massive shot to send the tough Latvian down a second time. Nikitenko made it to back to his corner but was in clear distress, then seconds later he dropped to his knees and seemed close to throwing up, this concerned his corner so much that they caught Referee Liam Bonner’s attention and retired their man in the corner. Fourth bout of the night, see Ben McGivern face Latvia’s Eduards Gerasimovs in a six rounder. McGivern swept across the ring like a force ten gale and just let rip with huge rights and lefts, Gerasimovs tightened his defence in an attempt to withstand the vicious assault, but when that just wasn’t holding back the banzai Scot, changed tactics and bravely went toe to toe, which instead of having the desired effect just played into McGivern’s hands - literally - and the Scot just began punishing the Latvian with power shots to body and head. About midway through the round the continual assault had the desired effect and down went Gerasimovs. Somehow Gerasimovs managed to beat the count, but as soon as the fight was restarted he must have regretted it as McGivern just went back on the attack. 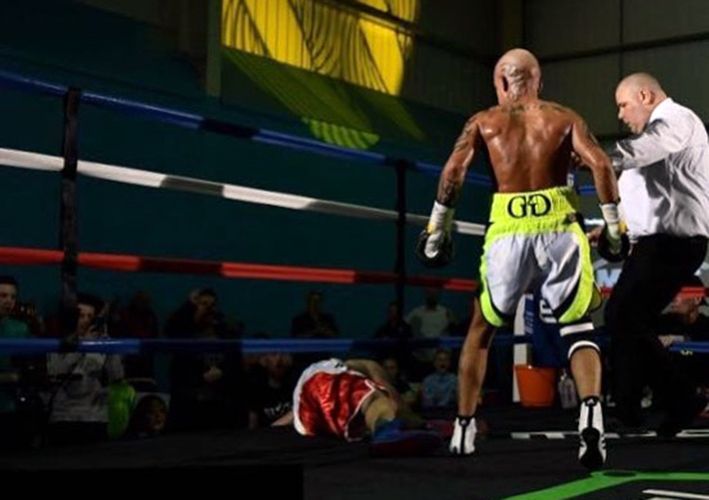 As the Round entered the final minute McGivern stepped it up a gear and basically backed Gerasimovsonto the ropes and began targeting the body of the Latvian again, and once more landed a seriously big body shot to send the Gerasimovs down for a second time. Once again the tough Latvian managed to beat the count, and once again McGivern went on the attack until the bell signalled the end of the first. McGivern started off the second the way he ended the first, full on attack, Gerasimovs was holding his own for the first twenty seconds or so, even though he was backed on to the ropes, but then left the smallest of openings and McGivern was in like a flash switching from left-rights to the head toslipping in a solid body shot that sent Gerasimovs down for a third time, this time though he wasn’t able to rise in time, leaving Referee Liam Bonner no option but to wave the fight off on the twenty nine second mark of the second round. The fifth and final contest of the night pitted Kick Boxing World Champion Jamie "Ginnie" McGinnis in his second pro boxing bout against Vladislavs Davidaitis in a four rounder. McGinnis came out hard and fast but just as he got in range it was Davidaitis that let rip first with a big Right before initially bossing the proceedings. McGinnis adjusted his game plan and did a little testing recce before lighting the blue touch paper to set off the fireworks in spectacular style, both lads were plain sensational throughout the first, so much so I couldn’t split them, score wise. More of the same in the second, McGinnis and Davidaitis vying for centre ring, each landing some beautiful shots, but as the Round progressed McGinnis began to target Davidaitis body so much so that around the midway mark he sent the Latvian to the canvas with a pinpoint perfect shot to the lower rib. Davidaitis made the count but was a little more defensive minded, which actually played into McGinnis’ hands, literally, and the canny Scot backed the Latvian onto the ropes and let rip with double handed combinations, Davidaitis could only counter on occasions, but that was enough to see him make it to the bell and the opportunity to get some advice from his coach. Right from the start of the third McGinnis went on the attack and again backed Davidaitis onto the ropes and began another double-handed assault,Davidaitis once again resorted to absorbing the punishment and countering when an opportunity arose. Davidaitis managed to spin away and then use his jab to keep the ever forward coming Scot at bay, then just on the minute mark McGinnis threw a sensational right to the chin that sent Davidaitiscrashing to the canvas, his head going under the ropesand over the ring edge, to all ringside without doubt it looked like a definite knockout, and probably a bad one so nobody was surprised when referee Liam Bonner waved the fight off on the one minute and one second mark of the third, but just as he did the seriously tough Latvian stirred, raised his head and started to rise whilst complaining that he was OK and the fight shouldn’t have been stopped. Have to say at this point, I thought it was a big knockout, not just because of the way Davidaitis landed but also the way he went down, personally I am so pleased to see a referee taking such due care about the safety of the fighter, as on way too many occasions recently there have been some nasty injuries come about because a referee has let a fight go on longer than it should. All in all, even though no fight went the distance, it was a still an excellent, highly entertaining night of boxing, one I am sure the fans enjoyed as much as I did.